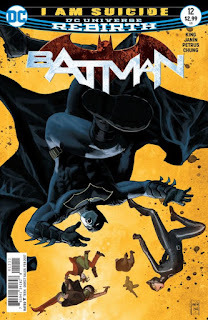 Tom King knows Batman, let me just start with that. He’s great at writing him. “I Am Gotham” was an amazing arc in Batman’s mythology. “I Am Suicide” on the other hand, I’m not so sure yet. It’s dragged since part 2 I think, for me anyway, because the story started going nowhere fast. With “I Am Suicide” Part 4 finally here, let’s take a look at to see if it’s any better. Instantly, the art hits you. This truly is a beautiful Batman book. Janin knows how to draw Batman so great. Not just Bats though, all the characters and the backgrounds, as well. It’s a very pretty book to look at. Thankfully, it hasn’t been the only reason to pick up this book. The story on the other hand is hardly in this issue. The whole issue is Batman fighting Santa Prisca guards fighting his way to Bane. But wait, didn’t he already do this? Yes, even at the end of the issue he reaches Bane. Issue #11 showed us that Batman was in the vent of Bane’s lair so where did he go? Why didn’t he just stay put? 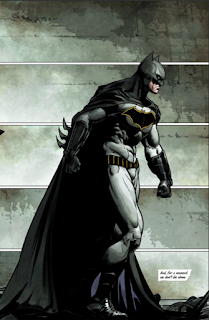 Unless, this is someone else dressed like the Bat as a decoy? I hope King delivers some answers on this problem and I’m going to give him the benefit of the doubt that he’s going to. I feel like he’s competent enough to actually resolve these issues because this has to be going somewhere. Throughout Batman’s way to Bane (again) we get letter snippets, mirroring Selina’s letter snippets from issue #10. Here, it seems Bruce is replying to Selina’s letter, spilling his feelings about being The Bat-Man. Before I get into analyzing this thing, I want to say I wish this issue and issue #10 was meshed together. Having Selina and Bruce’s letters to each other back-to-back would have been so great. I feel it would have speeded things up with the story and just gotten it out of the way. 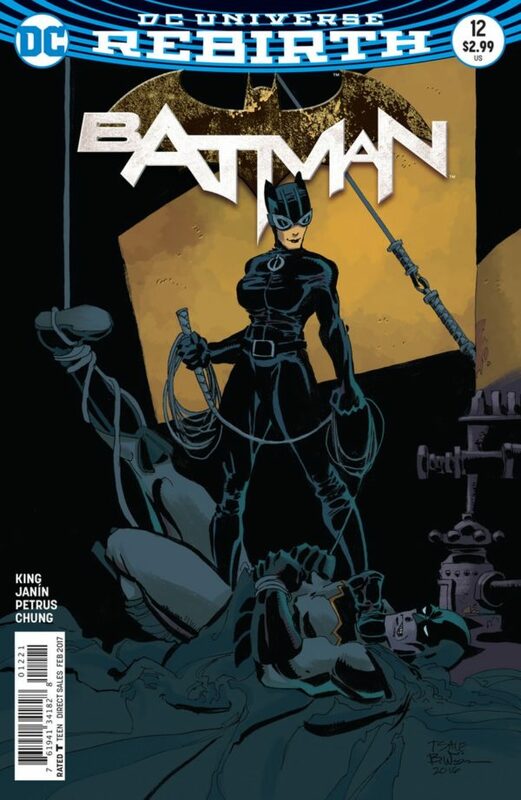 This issue is very similar to #10 because most of that was Selina’s letter with action in the background, like this one. What really got me is that he confesses that he considered suicide at just 10 years old. With a blade in his hands, pressed against his wrist, he prayed and no one answered. And it hit him. The people of Gotham are in the same exact situation as him. They have a blade pressed against them, they pray and no one answers. He used to think it’s silly to dress as an animal, fighting criminals but it’s necessary. He needs to be there for him and he wants vengeance. He vowed to fight criminals in his parent’s name so no pain is done to anyone else for the rest of his life. Damn. Just damn. It was so amazingly deep for me. This was just two pages, one big splash but it was just so amazing. King just revealed something so revealing about Bruce and his psyche that no one has really delved into. He added something so great to his character and I feel this is history in the making for Batman’s character. The way I understood it, is that Bruce didn’t physically kill himself. But psychologically, he was gone. He was what would now be The Bat-Man, it just left me wowed. Analyzing this issue again, just these two pages, it actually made me like the issue better. I connected to Bruce at that time because, without getting too much into it, I know how he was feeling and what he went through. I did too, I just didn’t become Batman. In the end, Batman #12 is not a perfect issue. It was almost a waste of an issue but the revelation in Bruce’s psyche makes this a very important issue for the character. It’s that revelation that makes it worth it because not a whole lot happens.